Facebook has announced a new partnership with different music companies around the world to enable users to upload their favorite music by using a list of the latest favorite songs like “Havana” by Camila Cabello, “Welcome to The Jungle” by Guns N Roses, and “God’s Plan” by Drake. The new update will definitely give people the chance to express themselves on the platform in their posts, and it comes with a new feature too—Lip Sync Live. 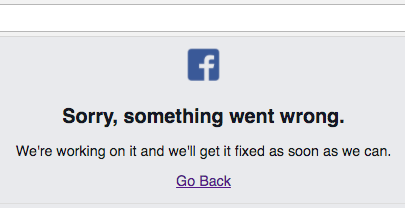 “Together with our amazing music partners, we’ve been building a foundation for new music experiences on Facebook. Today we gave an update on these efforts: we’re starting to roll out the ability for people to add music to the personal videos they share and testing a new feature, Lip Sync Live. We’re just getting started. 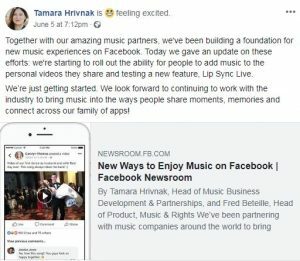 We look forward to continuing to work with the industry to bring music into the ways people share moments, memories and connect across our family of apps!“ Tamara Hrivnak, Head of Music Business Development & Partnerships, said on a Facebook Post. When you start to share live video with your friends you can choose the Lip Sync Live option, then you can add a description and customize your video with masks or background. Otherwise, your friends will be able to see the artist and song highlighted in the video and can also tap to follow the artist when broadcasting with Lip Sync Live on Facebook. The company always seeks to develop, renew and introduce music to the application in a suitable manner for all users to facilitate the connection between friends and family member and save the special moments and memories for a long time.